Not me, silly! The horses! All the cows at the Bar W ranch had been rounded up, and the next event at the Carrizozo Cowboy Days celebration was the parade. I was wandering around town with an hour to kill before it started and happened upon this scene. 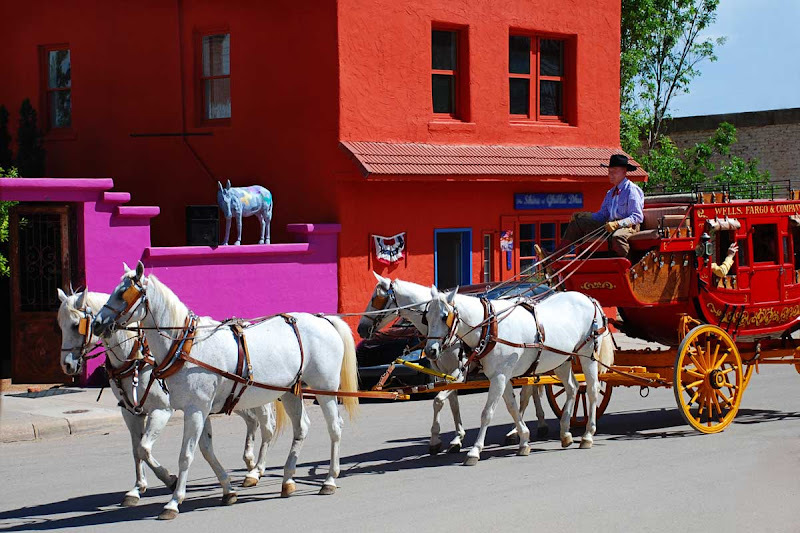 My first thought was, "Wow...this isn't your average small-town New Mexico parade." My next thought was, "Photo op!" I asked the teamster if he would mind if I took a few pictures, and he gave me carte blanche. Then he mentioned that Wells Fargo didn't have a photographer for its New Mexico events and would I be interested and could I send him one of those round things with the pictures I took and he would send it to those banker folks in San Francisco, and the next thing I knew I was taking a bazillion pictures of the Wells Fargo hitch. If those banker folks in San Francisco like them, this could turn into a regular gig. 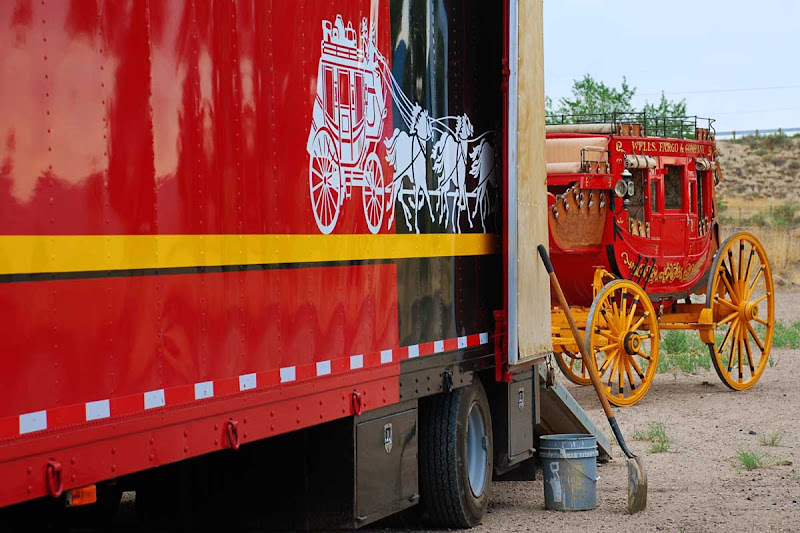 Mr. Hatch, the teamster, explained that there are 20 such Wells Fargo teams across the country, and each has a territory where they make appearances in parades and events. 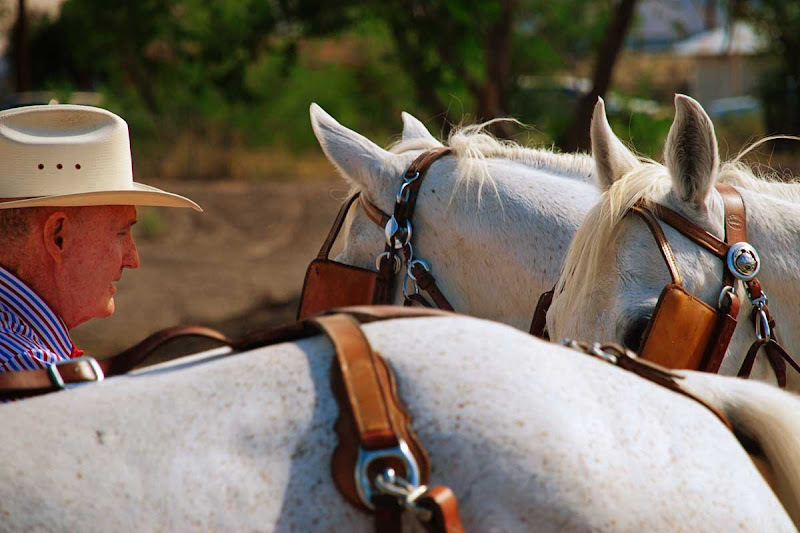 He and his wife own the four white geldings that comprise this team, and they are based in Mesa, Arizona. 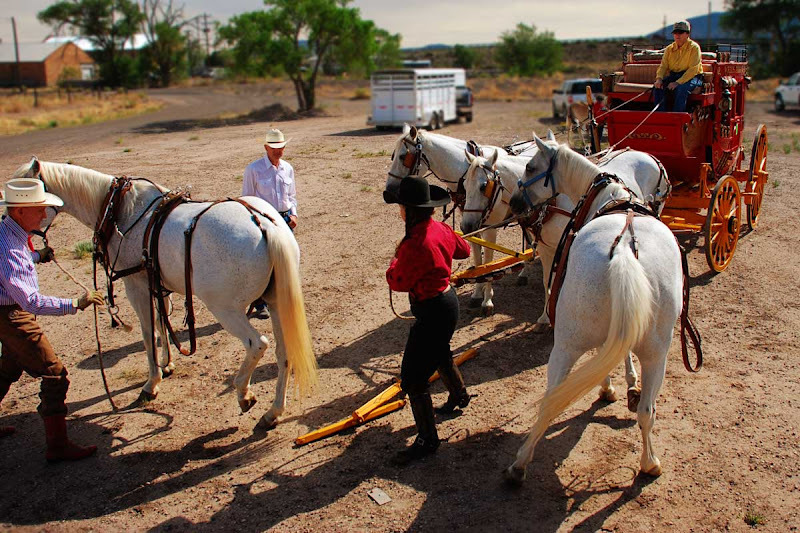 Fitting the harnesses and getting the horses hitched up was a carefully choreographed dance. I probably should have been taking notes instead of pictures, in preparation for the day when George and Alan are ready to pull a wagon. 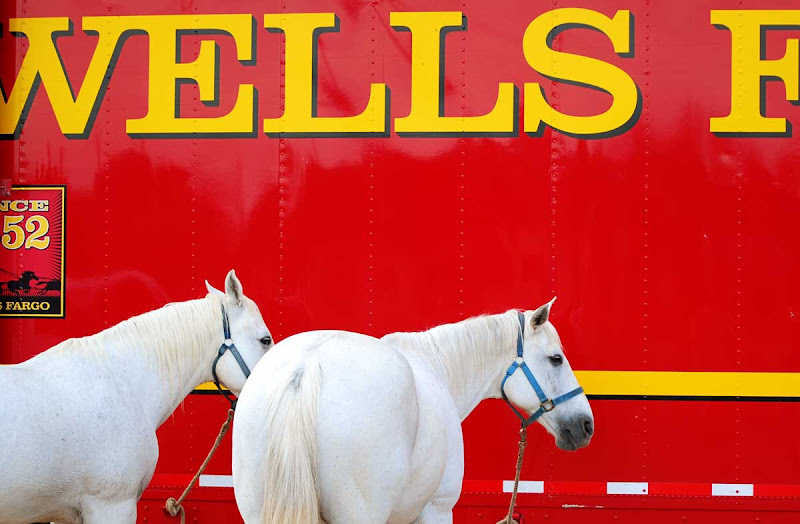 Hmm...do you think Wells Fargo would hire a two-burro team to pull one of their stagecoaches? We can dream, can't we? The four white horses were a striking contrast against the colorful buildings of downtown Carrizozo. The burro atop the fuscia wall is part of Carrizozo's public art project. There are 30 painted burros located throughout town. They will be auctioned off in the fall, with the proceeds going to local animal rescue efforts. As if this town weren't cool enough already. Tomorrow, steer clear, the longhorns are coming. I think George and Alan would be in fine company! Now that's a goal! Fingers are crossed that this would become a regular gig ... how cool would that be!?!? Beautiful colorful pictures. Are you going to bid on one of the painted burros when the time comes? Hey Carson: Please, please take me with you next year. Great pictures. I'll have to keep my eye out for a Wells Fargo team. They don't do business here so it will have to be out of state. The team looks very impressive. Very good pictures. Good luck on getting the photography gig. Great pictures. Hope you and Wells Fargo get together, how cool would that be. how totally cool! 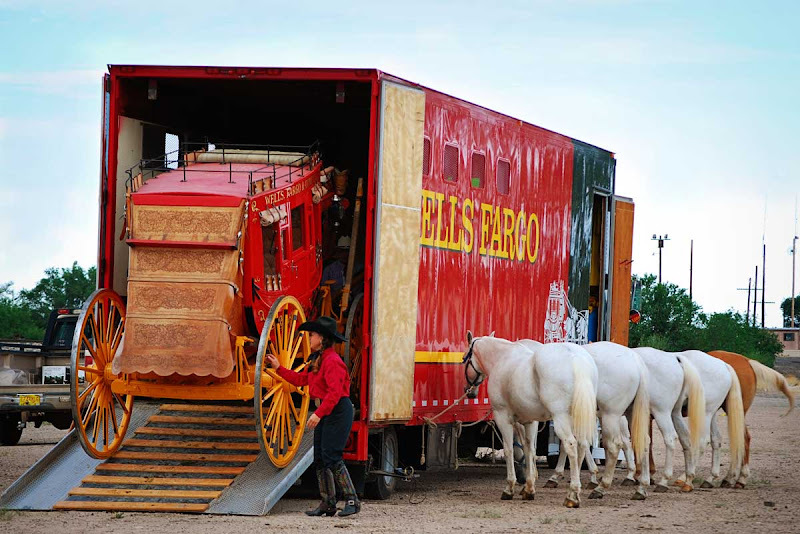 if i already did not love wells fargo i would now~! hope you get the photography gig that is dream stuff and Alan and George would need a minature wagon ... hummm who knows what could come from this set of pictures! Of course they will want George and Alan, everyone does...but you will be too busy taking pictures, so you will have to hire me to handle George and Alan...Don't worry, i work cheap!!! Great job, how fun to witness this in action, my favorite is the cowboy over the horse's back, great cropping on all the horses. I would love one of those burros, I'm sure they will be too pricey for me but what a great cause, hope they raise lots of money. One of my local towns did that with painted bears. Wow, that town is cool! There was a Wells Fargo coach in the two parades I rode in last year. Rico, my grandmother's 25-year-old (or more) Paso Fino kept trying to race the two shires pulling it. So embarrassing. What kind of camera/lens do you use? Pat, I'd love to have one of these burros for my garden but last year at the auction, they went for $2,000 and up. Maybe I'll win a lottery before this year's auction rolls around. Anonymous, I use a Nikon D80. I think most of these shots were taken through the Nikkor 18-135mm that came with the camera. Sigh. I want to move there. Please please!! The white horses against the red trailer really pops! 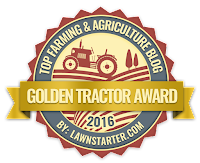 By the way, I sent a link to your site to my sister and niece to see the roundup photos. My niece was wondering if you sell photos because she'd like to hang them in her home. I'm telling you, you've got a great talent! Hope the Wells Fargo thing works for you. Hmmm. I wonder in who's ear here in San Francisco I can put in a good word. Seeing's as how we just stole Mesa, Arizona's police chief and all. The least SAn Francisco can do is give you the photo contract. White quarter horses? Very unusual and very pretty!!! 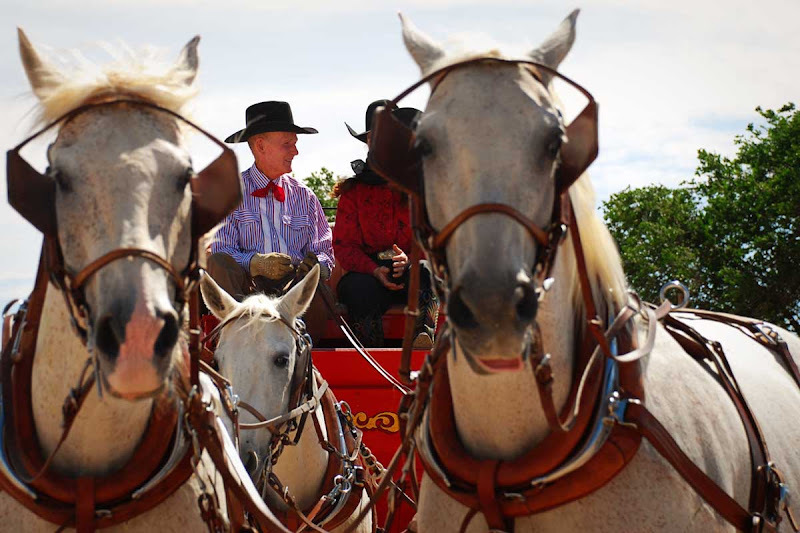 Sounds, like you may have struck gold, lol, taking photos for the Wells Fargo stagecoach.